In Southern Oregon, the lack of affordable housing edges out a growing number of people. When I cranked up my giant boom box in the morning during the summer I was sixteen, more often than not I was treated to the rich, throaty sounds of Tina Turner asking “What’s love got to do with it?” It was 1984, and I was growing up in a suburb of Sacramento, and while Turner’s words were lighting up the radio dial, not much love was being shown to the poor: funding for social services and public housing throughout the United States was being slashed under the eye of Ronald Reagan, who was serving his first term as president. 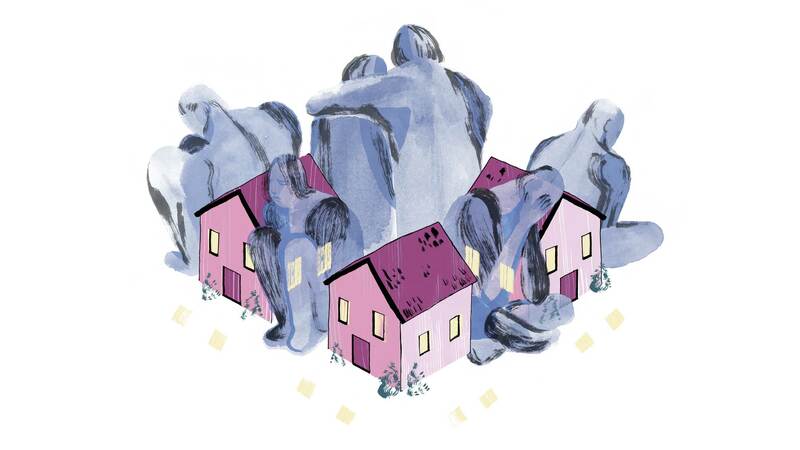 What I didn’t know then as a sophomore in high school, and what I do know now as a longtime peace and social justice volunteer in Ashland, Oregon, is that “choice” implies opportunity—but for people living on the street, opportunities are few and far between, especially when it comes to housing. Every year, the US Department of Housing and Urban Development counts homeless people on one night in January in communities across the nation. During one night at the end of January in 2015, volunteers counted more than two hundred homeless people inside Ashland city limits and more than thirteen thousand across the state of Oregon. Some couch-surf among friends and neighbors or live in cars. It’s illegal to camp here, so they shuffle around the city to avoid interactions with local law enforcement agencies, and those with children pretend they aren’t homeless for fear their kids may be taken away from them. A small group of us started serving meals to people struggling with homelessness last November, and thanks to thousands of volunteer hours, we’ve served thousands of meals since then. Dubbed the Crockpot Brigade, volunteers arrive every Friday, their arms laden with homemade food. Over the year the meal has moved from a community center to a neighborhood park, and has found a more permanent location in Pioneer Hall, just on the edge of Lithia Park. On our busiest Fridays we’ll serve about ninety people, but we average sixty on a steady basis. For some, the dinner is their only meal of the day. They feast and then fill up containers for the next day. The meals also offer a place for community, where people of all ages and incomes gather. Red is one of the people I’ve met through the Crockpot Brigade. He has a cobbled-together one-ton truck and trailer that he uses to haul everything he owns. It breaks down often and needs expensive brake work. A modest Social Security check helps him stay current with auto insurance and minor repairs. At night, the cab of the truck is his shelter. “If I could just get some decent sleep,” he says. “But I think it would take sleeping pills at this point.” His age and health issues make him an easy target for unscrupulous people, and friends worry that he might not live through another winter. Often his whole body is rattled by a persistent cough, but health care is out of reach. He doesn’t trust anyone enough to seek help, and his closest friends haven’t yet been able to talk him into visiting a local clinic. In 2010, US Census figures show the vacancy rate for rentals in Jackson County was 6.7 percent, higher than Portland's but below the national average. By November 2015, the vacancy rate in Ashland had fallen to between 1 and 2 percent, as rental prices dramatically increased. These numbers are echoed in many communities throughout the state, as a rental-housing crisis has widened the gap between the haves and the have-nots. Part of the conversation about the solution to homelessness must center on affordable housing, but in the current rental market this seems nearly impossible: there are barely enough units to go around, let alone a surplus. With less housing available to move into, more people are destined to be edged out onto the streets, and the number of homeless families in Oregon will multiply. In Jackson County, charitable organizations like the Society of St. Vincent de Paul, which offers limited rental assistance, among other things, are already feeling the pressure of increased need for their services. St. Vincent recently tried to prevent an elderly woman from being thrown out of her apartment. Charu Colorado, an Ashland-based artist who’d lived in the same apartment for twenty-three years, was given a thirty-day notice that her rent would increase by nearly 50 percent after the complex was purchased late last summer by Pacific Properties, a management company owned by Ashland resident Ron Deluca. At first Colorado thought she could reason with the company. But “the state of Oregon has not got a law to protect renters,” Colorado says. “They can raise the rent the next day if they want, but they usually wait a month. A month is nothing.” Such a dramatic rent increase was impossible to absorb for Colorado, who lives on a modest fixed income. The threat of losing her home affected her health and well-being. “Within two weeks I could not remember. If your name was Deb, I could not remember,” she said. “I had seen my doctor before, immediately before. I never had any trouble with that.” She believes her sudden decline was attributable to the stress of her situation. Besides the fact that Colorado lacked the mobility to simply move out, the apartment was her home. She’d grown flowers and vegetables in the soil outside her front door and had made improvements on the property. The previous management company described Colorado as a good tenant about whom there were never any complaints. When St. Vincent de Paul stepped in to help, the threat of eviction weighed heavily on Colorado’s mind. “I don’t want to go now, because I just couldn’t get out of here and maintain myself,” she said. “I have twenty-five years of work all filed downstairs. I’d like to stay at least until spring.” To help ease her worries, St. Vincent pledged to help her pay the difference between her old rent and the considerably increased rent for a few months. With help from friends, she found another place to live, and celebrated her ninety-seventh birthday in January. That was the case for my own family last July, when we suddenly received an eviction notice after our landlords decided to sell the house in Ashland’s Railroad District where we’d been living for six years. Desperate to keep our children in their schools, we began an online fund-raising campaign, and our community rallied around us. We were fortunate to locate a tiny mobile home for sale on the edge of town, raise $15,000, and become first-time home buyers. Most folks aren’t that lucky. Often we’re told that people are homeless because they’re lazy and don’t want to work. What most people who spout such balderdash don’t see is that, according to the National Law Center on Homelessness and Poverty, nearly half of the people experiencing homelessness nationwide hold down a job. The guy who pumped your gas last week, the woman who cleaned your motel room, your child’s preschool teacher—all might be examples of people who live in hiding, sleeping in their cars or couch-surfing between nights at shelters. This is the new face of poverty in America. Vanessa Houk works on social justice issues in Southern Oregon. She resides in Ashland with her husband and two daughters. In the early 1970s Oregon chose to severely restrict the land areas that could be built on in order to preserve large areas of farm and forest. At the same time it began to make building more expensive through a variety of regulations and zoning. Both moves were intended to serve worthwhile purposes. Both also made affordable housing in Oregon much more scarcer. Add to that the simple fact that when you have a beautiful state with lots of opportunities for high tech, the arts, entertainment, and dining--you're going to get growing demand. That will add to competition for housing and housing becomes less affordable. Government programs might address the homeless problem, but they cannot address affordability for lower income people. When government builds housing, the square foot cost is anywhere from 50-100% higher than privately financed and built housing. The process for planning and approval is labyrinthine. The answers are not many. More flexible regulations and zoning will help. I've proposed the creation of for-profit, local employer consortia to build housing for employees. These will work but they require local organizers to gather the investors. Oregon has an affordability squeeze, even a crisis. It's largely the trade-off for having made Oregon's cities sophisticated and attractive and preventing development on farm and forest land. In other words, for better or worse, we built the housing problem. Despite our reputation for innovation, almost no one is proposing innovative solutions. A beautiful essay on a widespread problem. Thank you, Vanessa. I am now aware that some of the homeless are either heroin or meth addicts. I saw a woman sitting by the road today in Medford, with a sign saying "homeless and hungry, please help". It was obvious to me by her appearance (very thin with a sunken face) that meth is her issue. It is heartbreaking! So many addicts. What is to be done for these people? Most do not have supportive or wealthy families to send them to rehab. Most have worn out their welcome with family & friends, from whom they often steal. Are they just dying on the street, or under a bush? Are there statistics on these addicts? My heart hurts for them and their families.